On Saturday, October 6, the community of Rehoboth Beach, Delaware, will celebrate their 2018 Boardwalk Buddy Walk®. 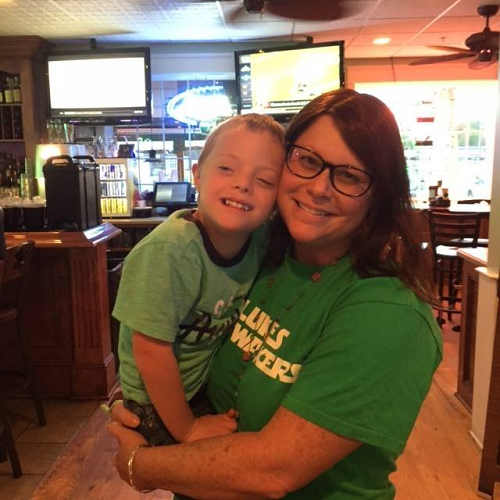 Rehoboth means “a place for all,” making the town of Rehoboth Beach a great place to hold an event which raises awareness and acceptance for those with Down syndrome. Rehoboth Beach is a very family oriented beach town along the East Coast and this Buddy Walk® event has a very warm feeling. Centered around the bandstand in the heart of town, this walk is an uplifting and fun community gathering. 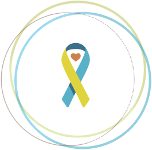 Established in 2006 by Dennis and Sharonlee Diehl, the walk event was intended to promote acceptance and inclusion for individuals with Down syndrome in their community. Inspired by Sharonlee’s brother David, who has Down syndrome, they wanted to create an event that put community involvement at the center, to allow residents to become more comfortable including individuals with Down syndrome. The first year of the event, they had 13 buddies and around 350 participants. They have watched the event grow each year, and last year had 90 buddies and close to 2000 participants. The success of the Boardwalk Buddy Walk® is credited to that warm feeling that participants experience at the event. “It’s that feeling that keeps bringing people back. We love being together,” explained the walk committee (which consists of Dennis and Sharonlee, along with Michelle Hetherington and Liz Evans). The two day event brings together a huge extended family, and people make a weekend out of it. They enjoy the Buddy Up party on Friday night, and the fellowship carries over into the Buddy Walk® the following day. The walk committee hopes that participants get the message that their walk isn’t just about fundraising, but also about including those who are different from them. They want to put forth a message of acceptance, and this is what keeps bringing people back to their event, year after year. Their entire community gets involved with the event; the majority of the local businesses and eateries display welcome banners, and they offer discounts and prizes to participants. Because their event is out in the open, it’s very obvious to all visitors that something special is happening that weekend. There is a very festive vibe to their event, which is clear to see when everyone starts dancing together on the bandstand. “People just dance with whomever is next to them,” the committee explained. “No one has their guard up, they hold each other’s hands and dance!” One participant posted on Facebook that “this is the coolest club I’ve ever been in,” and they want everyone to feel that way. There have been many memorable moments at the Boardwalk Buddy Walk®. From celebrity guest Chris Burke’s attendance, to a self-advocate’s annual rendition of Frank Sinatra’s “My Way,” to NDSS President Sara Hart Weir’s presence to honor them as Buddy Walk® of the Year in 2016, Buddy Fest Weekend is always a remarkable event. 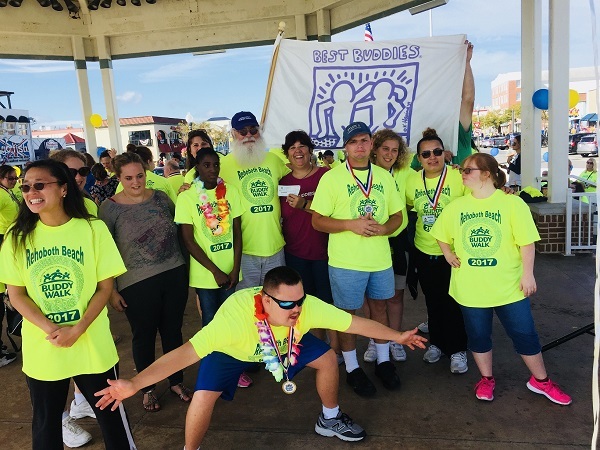 The Rehoboth Beach community is very generous, and because of that generosity, the Boardwalk Buddy Walk® committee is able to donate to several local organizations with the proceeds of their event. They support their local families, Special Olympics, the Salvation Army, Best Buddies, and local programming from KSI and Chimes. Although over $80,000 was raised last year, as a result of their year-long fundraising efforts, the committee stressed that it’s “never really been about the money, but about the awareness.” They just want the community to get involved, they want everyone to know they are welcome, and they want everyone to just go and see what it’s all about. We look forward to watching this event as it continues to grow! To show your support for the 2018 Boardwalk Buddy Walk®, please visit their fundraising site at http://www.ds-stride.org/boardwalkbuddywalk.